in the street just 24 hours after his release. Connor Jackson, 18, was among a group of 10 young males in Hawick who fell ill last week after taking the unidentified substance. But during the early hours of Sunday morning he was said to be searching for the person who had provided the drug while intoxicated and in possession of the offensive weapon. 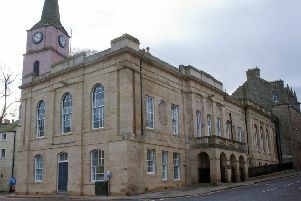 Jackson was arrested by police who were concerned at his behaviour and he appeared from custody on Monday at Jedburgh Sheriff Court where he pleaded guilty to having the knuckle duster on him. Deferring for background reports, Sheriff Peter Paterson said it was “astonishing” that after being hospitalised for consuming some sort of drug, Jackson was back out on the street 24 hours later intoxicated. He told him: “You seem incapable of learning a lesson in life. Instead you tried to take the law into your own hands looking for the people involved. upper most in the court’s mind. Procurator fiscal Graham Fraser said that Jackson and another male were seen walking in Dovemount Place at around 2.30am on Sunday as people were exiting a nightclub. He said: “He had used an unknown drug along with his brother and had just been released from hospital. “It appeared to the police officers he was intoxicated and in an angry mood. “He was looking for the person who had provided the drug. “The police were concerned about his behaviour.